The Song of Ice and Fire Game of Thrones Edition is now available for pre-order from our Green Ronin Online Store! the perilous waters of Westerosi politics and intrigue. Ronin’s A Song of Ice and Fire Roleplaying! When you pre-order the printed Game of Thrones Edition in our online store, we’ll offer you the PDF version for just $5 during checkout. You can get the same deal from brick-and-mortar stores who are participating in our GR Pre-Order Plus program. Ask your local retailer. 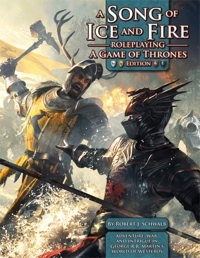 Pre-Order A Song of Ice and Fire Roleplaying Game of Thrones Edition today!